My guest today is one of my long-term homegirls, Chris Verstraete. She’s been and gone and done writ a zombie book, the mean thing. So I had to ask her about it. Christine Verstraete is a big Halloween fan who enjoys a good scare or two. Her short fiction has appeared online and in anthologies including Timeshares and Steampunk’d from DAW Books. Her new YA book, GIRL Z: My Life as a Teenage Zombie was released August 1. 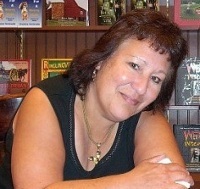 Stop by her website at http://cverstraete.com or blogs, http://girlzombieauthors.blogspot.com and http://candidcanine.blogspot.com. 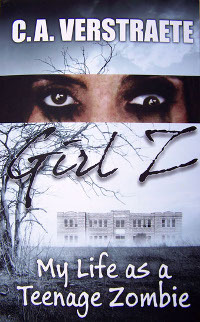 Marian, thanks for hosting me and you get to be the primo stop for the Book Launch Blog Tour for Girl Z: My Life as a Teenage Zombie, which was released August 1. Sixteen-year-old Rebecca Herrera Hayes’ life changes forever when her cousin Spence comes back to their small Wisconsin town carrying a deadly secret—he’s becoming a zombie, a fate he shares with her through an accidental scratch. The Z infection, however, has mutated, affecting younger persons like her, or those treated early enough, differently. Now she must cope with weird physical changes and habits no girl wants to be noticed for. But time is running out… Becca needs the help of her friends and other cousin to fight off hungry zombies and find their missing mothers. Q: In God’s name — WHY ZOMBIES? A: Oh, Marian, you know that I have a dark side, right? heh-heh. Funny thing, I’ve always liked Haunted Houses at Halloween and reading Stephen King. I wrote a weird little short story a year ago, “The Killer Valentine Ball,” never realizing that was the beginning. Q: I know you, and I know your zombies are not like anybody else’s zombies. Tell me how they’re different. Well… I decided to have the virus mutate and have my main character, Becca, turn only part-Z, with all the problems that entails. And as I hinted in some of my other stories, I tried to put some humor (it being subjective, of course) and have some quirkiness. That’s what GIRL Z: My Life as a Teenage Zombie is all about. Q: Did anything from your Real Life wind up in this book? Q: Do you plan any sequels? A: Hopefully. I do have a few ideas. Of course, that’s while I finish a couple other projects in the works, too. Q: Do you plan books putting the Chris V Special Spin on any other paranormal concepts? A: Didn’t realize there was such a thing. ha! Oh, the odd ideas I get… Working on a couple strange short stories at the moment. I don’t know where this stuff comes from. Honest. Q: If you could return to any time in the past and any place on Earth, when and where would it be and why? A: I was a dinosaur lover as a kid, but I sure wouldn’t want to go back that far. I think I’d pick the time of Cleopatra. Ancient Egypt was another passion. I’d thought of being an archaeologist growing up until I decided later to go to college for journalism. (Not sure that was necessarily a better career choice with newspapers dying now, but I’ve never regretted it.) But the legend of Cleopatra as the wise and beautiful ruler when men mostly ruled always fascinated me. I don’t really know why. Maybe it was the hieroglyphics…. or gasp! Could it be that even then I was fascinated by “brains”? You do know how the ancient Egyptians prepared the bodies for mummification, right? MA: I do, actually. YUCK! Here are SOME of the prizes! Thanks for visiting and sharing, Chris! Best of luck with the rest of the blog book tour. Y’all, don’t forget to enter the rafflecopter thing. A WRITING PROMPT FOR YOU: Come up with your own take on a “traditional” horror/mythological idea. This entry was posted in Guest Posters. Tagged guest writer, zombies. Princess Bride. YES, PRINCESS BRIDE! YES, AGAIN! 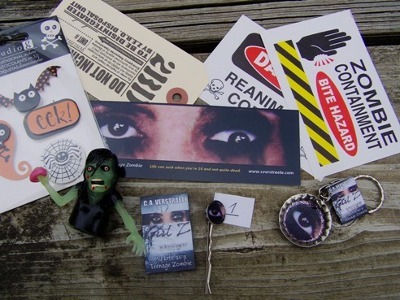 Chris Verstraete would love to share..GIRL Z: Teenage Zombie Book Launch Blog Tour Begins! Waiting for my copy of the book to arrive, can’t wait to read it!!! Grats Christine!! Having worked as an educational media specialist/school librarian in a high school for a number of years, I can tell you that teens love paranormal horror. And zombies are sizzling hot right now–just ask Brad Pitt! Good luck and best wishes for your success, Chris. 38,000…… Really???? Speed read? Jolie, I can’t wait to hear your comments on mine! A million would be great!!!!! Hi Chris — this is the first time I’ve been tempted to read a zombie book. You make it seem so . . . normal? Best of luck with the project! Okay, I may have to read this particular zombie book, but, most likely, I will recommend it to my son. He’s an avid reader and likes zombies! Great interview, Marian and Chris. Sounds like a fun book, Chris. I have it on my Kindle. Hope you sell loads of copies. Seems like it’s a fun book to promote. Thanks Gail, I did have fun – and then I got to editing. haa! Jen, hope you do read it and of course your son, too! Thanks Ellen. Can’t wait to hear everyone’s thoughts. Jolie, made a confession on FB about her, uh, “reading count.” haa! But it’s still a lot…. This book will make you laugh, have you disgusted but at the same time; show you what it is like to be a teenage girl trying to adjust to being different. This is a GREAT book! This has definitely piqued my interest! Going to GoodReads. NOW! Your book sounds so great. I love zombies stories, esp. when they can be retold in a new way. Can’t wait to read it. I don’t have a twitter account so can’t finish the rafflecopter, but thanks for the giveaway opportunity. Christine, congrats on your book launch!!! I think I dated a girl like Becca once. Well, twice.